Close up of Big Ben, Parlament, with the statue of Charles I on horseback, located in Trafalgar Square, London in a sunny day. 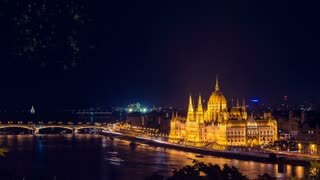 Budapest, Hungary - cityscape, view on the city, Parlament building and Danube river, landmark, tourist destination. Selective focus, pink.